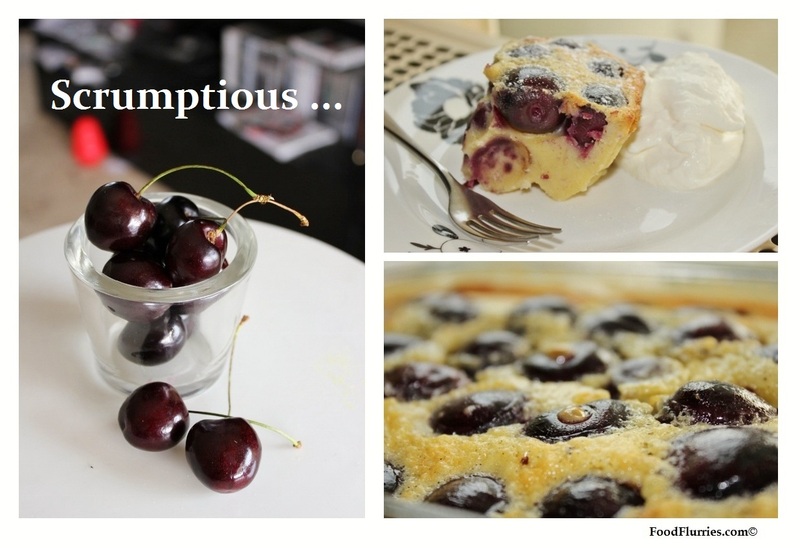 It’s August and I have come across some beautiful dark cherries in the store this week, and one thing came to mind almost immediately : Cherry Clafoutis! I have been meaning to make this ever since I watched Michel Roux Jr and Alain Roux demonstrate this in a YouTube clip. So simple it has only six ingredients. To put this all together is even simpler … if you can whip up a batch of pancakes, then you should have no problems with this one. Easy peasy. The beauty about this dessert is that you don’t have to look very far as far as ingredients are concerned. The only thing you’d need to buy as a spaciality item would be the cherries ~ everything else will be available in your everyday pantry stash. If this dessert is going to be consumed by kids then stick to the recipe as is. However if you want it as an ‘adults only’ dessert then spice it up a notch by adding kirsch ~ cherry liquor. This dessert is to be served warm … perhaps accompanied with a warming after dinner digestive too? Great for cool autumn evenings. I have gone the traditional route and left all the stones in the fruit; it is said to impart a better flavour to the pudding … however it makes cutting out nice, even slices a nightmare. So if you have the time and are not a fan of chewing round the fruit, by all means remove the stones prior to baking. 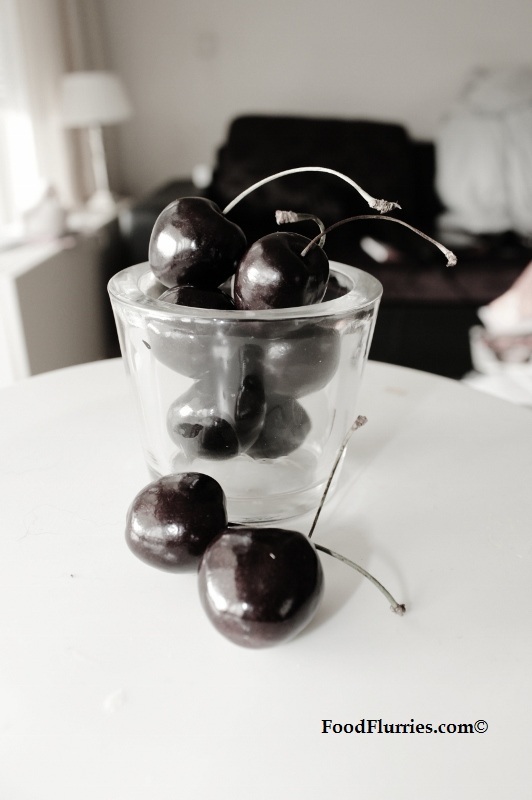 I’m not being hoity-toity by the way ~ if I had me a stone remover I would have had all my cherries stoned myself. from the vanilla pods and add them to the mixture. 3. Cut 20g of the butter into small pieces, set aside. Use the remaining 40g to generously grease an ovenproof dish, about 22cm in diameter and 3-4cm deep. Spread the cherries evenly over the base of the dish, then pour the batter mixture over them. 4. Carefully transfer the dish to the oven and bake for 10 minutes. Lower the oven setting to 180°C/gas 4, and cook for a further 25 minutes. Scatter the reserved butter pieces evenly over the top of the clafoutis and bake for another 5 minutes, or until set. 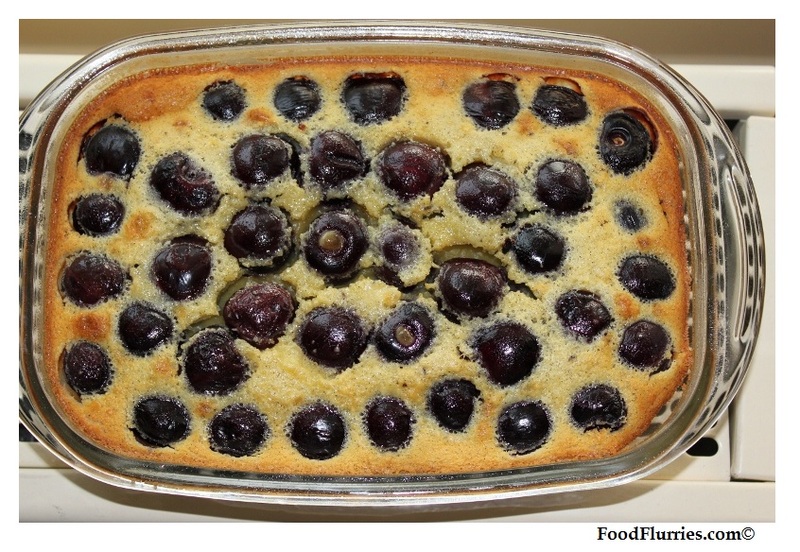 To check, carefully insert the point of a sharp knife in the middle, if it comes out clean, the clafoutis is cooked. 5. Sprinkle with granulated sugar or powdered sugar and leave to stand for 5 minutes. 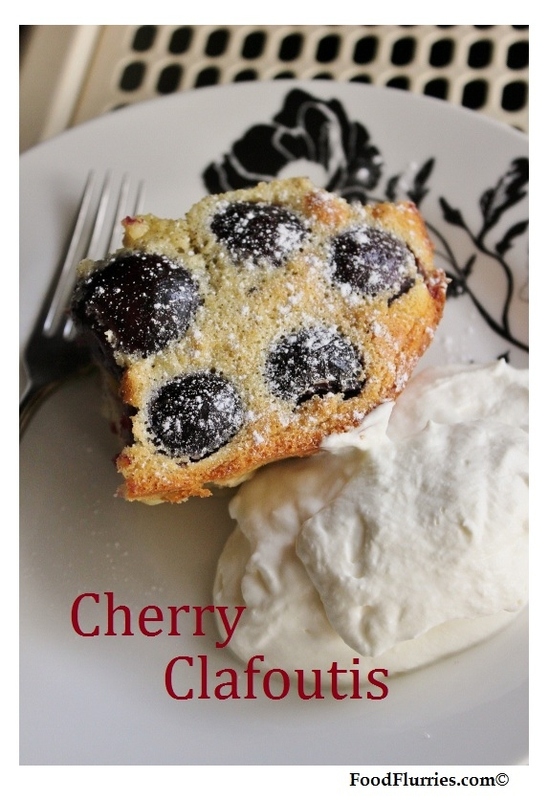 Serve the clafoutis warm, from the baking dish, on its own or accompanied by whipped cream or plain vanilla ice cream. Whilst researching the recipe for this, I noticed that some include a pastry bottom. That would make it a ‘tart’ wouldn’t it?? Well I don’t know which is authentic and which isn’t … I am no expert. In the video clip the Roux cousins demonstrate their version sans pastry casing, however in Michel Roux Sr’s pastry book he serves up a clafoutis with a pastry case … so there you have it. Both work I suppose. So anyway, give both a go and see which version you like best. As for me, I think I’m going to have me a slice of the clafoutis with generous amounts of cream. Ahhhh ….